As term one of school comes to an end, this week also marks the end of the current Parliamentary session. A lot has happened so far this year politically. I’m pleased to see New Zealand’s gun laws are being reformed in the wake of the horrific terror attack in Christchurch on March 15. Hopefully these changes will make our country safer. It’s also good to learn $10.5 million is being invested to expand Middlemore Hospital’s acute mental health unit, Tiaho Mai, which will enable it to accommodate 76 patients. I’m a huge advocate for the exceptional and difficult work the unit’s staff do. I’ve seen their skill and compassion first-hand, and they deserve more resources to help those in need. It’s disappointing, however, that the Government is yet to announce what changes it will make to the sector more than four months after it received the report stemming from its inquiry into mental health and addiction. More needs to be done to improve people’s access to primary mental health care and also to remind Kiwis of all ages that it isn’t weak to ask for help when they need it. I have called for the Government to do just that and will continue to advocate for action to be taken. Regular viewers of Parliament TV will know the question time format at 2pm on a sitting day. This year I have been asking Transport Minister Phil Twyford about the progress being made on creation of a busway between Auckland Airport and Botany/Howick. Local commuters deserve access to fast, efficient, and affordable public transport. A busway along Te Irirangi Drive is also a logical continuation of the Eastern Busway that is now under construction. 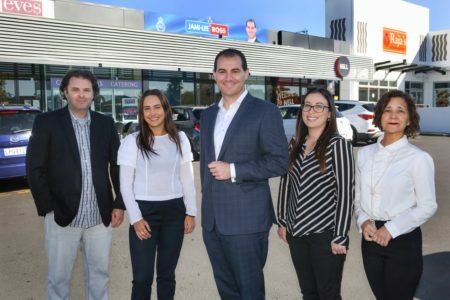 Botany MP Jami-Lee Ross and his team. (Left to right) Chris Harrowell, Mercedes Mudgway, Jami-Lee Ross, Ashleigh Harding, and Alex Ogino. Finally, locals may have noticed new signage at my Botany Road electorate office. We are fully staffed and fully functional, and my focus remains on serving our community as your local MP. Our team have helped thousands of people over the years and we continue to provide local constituency services. Please don’t hesitate to stop by or phone us on 271-3255.